Dentist Wheat Ridge: Have You Considered Mini Dental Implants? Have You Considered Mini Dental Implants? Do you have a missing tooth, jaw bone loss, or other dental concerns that you feel there is no solution for? You should consider mini dental implants as a great solution for restoring missing teeth and integrity to the structure of the mouth. Read on to learn more about mini dental implants and how they could help you! Someone might choose to use dental implants when they are missing teeth due to disease or trauma. Missing teeth can be replaced by dentures, bridges, or implants. Both bridges and dentures are replacement teeth that are not permanently attached to the mouth, but are removeable. Many people do not like the feeling of dentures, the maintenance, and the complications that come with eating with dentures in. Bridges are not always an option if you are missing too many teeth to be able to adequately anchor the bridge. Dental implants are a great choice for people who want a more permanent solution to missing teeth, don’t want the shifting or slippage associated with dentures, and want to restore integrity to the mouth structure. 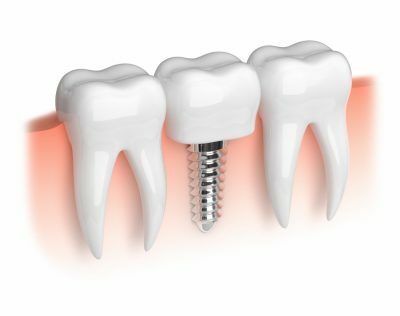 Dental implants are inserted surgically into the jawbone and the bone fuses to the titanium post over the course of several months. The post then acts as an anchor for new teeth to be attached to. While dental implants are a great solution for many people, there are instances where they can not be used. In some of these cases, the patient could opt for mini dental implants instead. Mini dental implants are similar to regular implants but are smaller. The process for getting mini dental implants is less invasive, and more cost effective. If the patient doesn’t have enough of the jaw bone structure left for traditional implants, mini dental implants may be a great choice. They can also be used to support bridges or dentures that are loose, or in places in the mouth where there is a missing tooth and not enough space for traditional implants. Because they are less invasive, the healing process after receiving mini dental implants is much less, and usually additional surgery and bone grafting is not needed. Fewer complications come from mini dental implants and many patients are more comfortable after this procedure than with traditional implants. Mini dental implants offer patients a great option when they can’t or don’t want traditional implants, dentures, or bridges. If you are thinking of getting mini dental implants but worried about caring for them, don’t fear! Mini dental implants need the same care as your natural teeth, and flossing and brushing will keep your mouth healthy and the implants intact. While you may have some soreness or sensitivity immediately after getting mini dental implants, brushing gently with a soft bristled toothbrush will help while you are healing. So don’t suffer with a missing tooth (or teeth) that make you want to hide your smile. Mini dental implants are a great way to restore the confidence that you may have lost, in a less invasive way than with traditional procedures. If you think you could benefit from mini dental implants, contact Aspen Hill Dental in Wheat Ridge to consult with a dentist!